A few weeks ago, I wrote a post about my introduction to the Rocky series, and I discussed Rocky and Rocky II. 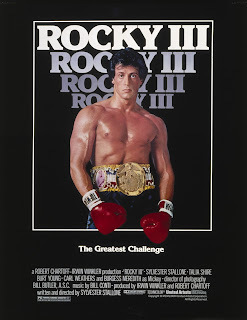 Today I'd like to continue the story with Rocky III. Of all the Rocky movies, this one was my favorite. I don't know if it was necessarily the best of the films, but I enjoyed it the most. Rocky III starts out (much like Rocky II) with the fight from the end of the previous movie. Rocky defeats Apollo and is crowned the heavyweight champion of the world. 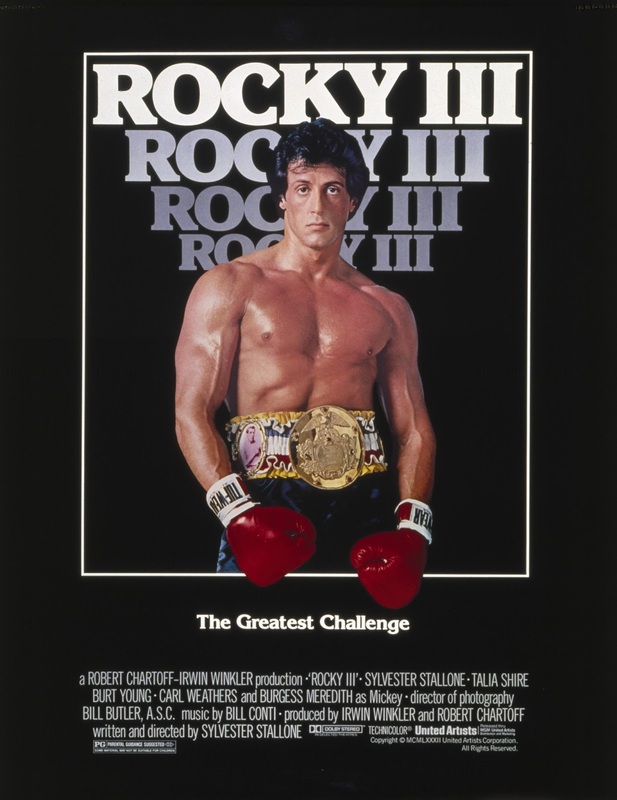 What follows is a montage of Rocky living the high life - appearing on magazine covers, endorsing products, defeating challengers, and signing autographs. The montage is set to a song that became synonymous with Rocky in popular culture, a song that I assumed was in all of the Rocky films: Eye of the Tiger. In contrast with Rocky's successes in the film's opening, we also see two other people's perspectives. The first is Clubber Lang (the film's antagonist) watching Rocky's fights. We can see he wants a shot at the belt, and is quite a good fighter himself. He's won a string of fights, all of them by knocking out his opponents. The other person we see is Rocky's friend (and Adrian's brother) Paulie. For some reason, he seems bitter about Rocky's good fortune, and the attention and wealth it brings. Eventually, when Paulie sees a Rocky pinball machine in a bar, he snaps, and destroys the machine. Rocky ends up having to bail him out of jail, and the two have a verbal confrontation. Paulie insists that Rocky owes him, for everything Paulie's done for him. He introduced Rocky to his first girlfriend, and to Adrian. Rocky, Adrian, and Rocky Jr. had moved into a mansion, and invited Mickey to stay with them, but what about Paulie? Rocky fires back, telling Paulie that no one owes him anything, and that friends certainly don't owe each other anything. If Paulie needed a place to stay, why didn't he just ask, instead of feeling like everyone had wronged him? Paulie, realizing Rocky is right, humbles himself, and Rocky allows him to move in. While Paulie doesn't suddenly become a paragon of virtue, living in a family setting - as Uncle Paulie - does seem to make him into a better person. One day, while the city of Philadelphia is dedicating a memorial to Rocky (a statue of him with his fists raised in the air), Clubber Lang calls him out, and challenges him to a fight for the championship belt. Mickey tries to silence him, but Rocky tells him he'll fight Lang any time, any place. Afterwards, Rocky confronts Mickey, asking why Mickey tried to stop the fight. Mickey confesses that he's been picking easy opponents for Rocky since he became the heavyweight champion. He didn't want Rocky to get hurt. As a result, Rocky has gotten soft, and Mickey doesn't think he'll stand a chance against Clubber Lang. But Rocky, wanting a real fight, begs Mickey to train him to fight Lang, promising to spend all his time in the gym training. In the training montage, though, we see a marked difference between Rocky's preparations and Lang's. Rocky is in a large facility that looks more like an exhibition hall than a gym. He is constantly interrupted by fans wanting photos or autographs. Lang, on the other hand, trains more like Rocky trained for his fights against Apollo. The day of the fight arrives. As Rocky is entering the arena, he and Lang come to blows. Mickey, who is trying to stop this scuffle, is pushed down by Lang. He doesn't get up, and it becomes clear that he's having a heart attack. They call the paramedics, but meanwhile, Rocky is told to go out and fight Lang. The fight is over almost before it begins. Lang knocks Rocky out in the second round. Rocky shamefully exits the arena and approaches Mickey, who is lying on a gurney. Mickey asks if the match is over already, and Rocky tells him it was a knockout. Mickey mistakenly thinks that Rocky won the fight, and he dies congratulating Rocky. Rocky is devastated by Mickey's death. In some ways, the significance of Rocky's defeat by Clubber Lang is more symbolic than literal. Yes, he lost the fight, and he lost his title. But his real defeat came long before. He'd lost track of who he was. He'd let himself down, and he'd let Mickey down. And without Mickey - who was like a father to Rocky - he wasn't sure where to go next. The answer to that question is answered by the least likely person: Rocky's former rival, Apollo Creed. 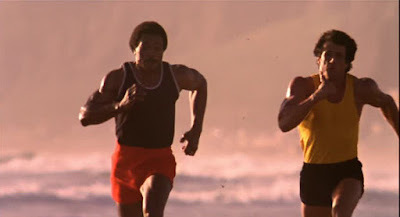 Apollo tells Rocky that while part of the reason for Rocky's defeat was his distraction over Mickey's condition, the real reason he lost his because he'd lost his hunger for victory, the "eye of the tiger." Lang won because he wanted it more, just like Rocky had defeated Apollo because Rocky wanted it more. Apollo agrees to train Rocky, to give him what he needs to defeat Lang and reclaim his title, in exchange for "a favor." But Apollo won't tell Rocky what the favor is until after the fight. Apollo takes Rocky across the country to Los Angeles, where he got his start. Here, Rocky learns a new style of boxing. Before this point, he'd relied on hitting hard and being able to take punches. Now he learns how to move his feet. Lang is a powerful hitter, and Rocky will need to be able to move quickly to avoid his punches. But Rocky's training doesn't go very well at first. He feels guilty about Mickey's death, and he is overwhelmed by fear that he will lose, fear that his career is over. It takes a heartfelt speech by Adrian to snap him out of it. She tells him that it is important that he fight Clubber again, not to regain his title, but so that he won't be controlled by fear. While Rocky and Apollo train, they also become good friends. So much so that before Rocky's rematch with Lang begins, Apollo gives him his iconic red, white, and blue shorts to wear for the fight. I love the interviews with Lang in the lead up to the match. Because he has no reason to believe this match will be any different than the match in which he knocked Rocky out. When asked if he hates Rocky, Lang responds with what would become Mr. T's trademark phrase: "No, I don't hate him. I pity the fool." But even more than that, I love what he says when the reporter asks for his prediction for the match. He looks directly at the camera and says one word. "Pain." To Lang's surprise, Rocky dominates the first round. Rocky is light on his feet, dodging Lang's attacks and delivering several blows of his own. Lang, frustrated by his inability to hit Rocky in the first round, comes out swinging in the second. Rocky takes the punches and taunts Lang, disregarding Apollo's advice. In the third round, Rocky continues to let Lang hit him, and we see how exhausted Lang is getting. Rocky pounces on this opportunity, going back on the offensive. In no time at all, he is able to knock Lang out, reclaiming his title. Instead of ending with the conclusion of the big fight - like the previous two films did - we get to see what Apollo meant when he said Rocky would owe him a "favor." He wants a rematch, with no cameras, no audience, no referee. Apollo starts the match by ringing an imaginary bell, and the two circle each other. Just as each of them throw their first punch, the film cuts to the end credits. This movie does a great job of continuing the themes that were prevalent in the first two movies - perseverance through adversity and the mutual support given by spouses to each other, which I touched on in my previous post - while also bringing new themes to the forefront. One of these is the necessity for a man to have other strong male figures in his life. We see this is true for Rocky, first with Mickey, and then with Apollo. Rocky seems lost, and without purpose, when Mickey dies. Apollo steps into Mickey's role in some ways, but he is not just a substitute. While Mickey was more of a father figure for Rocky, Apollo becomes like a brother to him. This is not to say that Adrian's contributions are not significant - Apollo would not have been able to get through to Rocky during training if Adrian hadn't intervened. This next theme might seem pretty weird, but I figure I'm not doing my job if I don't raise some eyebrows. Rocky's confrontation with Paulie at the beginning of the movie serves as a refutation of the Pelagian heresy. Wait, what? Yeah, you read that right. Pelagius was a 5th century heretic who taught that one's eternal destiny was entirely determined by human choice. There was no original sin which would predispose people towards sin. Salvation, therefore, was something that was earned by your good works, as opposed to a free gift from God. Paulie seemed to think he had earned assistance from Rocky, by everything he had done for Rocky in the past. He had done his part, so Rocky owed him. Rocky sets him straight. He is Paulie's friend, and he will help Paulie out because he loves him. All Paulie has to do is ask. Finally, there is the concept of the underdog story - a protagonist overcoming impossible odds. This was present in the first two films of course, as the amateur Rocky takes on the heavyweight champion Apollo. But it is brought into clearer focus in Rocky III by the use of contrast. In the first half of the movie, Rocky is not the underdog - Clubber Lang is. But after Rocky loses his title, the odds are once again stacked against him. I was pondering why it is that people love a good underdog story. It must be that we identify in some way with the heroes in these stories. Life throws a lot at us sometimes. I know that for me, between my losses, raising a toddler, and the state of our culture, sometimes it seems like I don't stand a chance. Movies like the Rocky series are an escape from the pressures of real life, and a source of hope that I will be able to beat the odds. I watched the Rocky movies on Amazon Prime, but apparently most of them aren't available to stream for free anymore. The following links will take you to the Amazon page for each of the Rocky movies. From there, you can either purchase the movie on home video, buy or rent the digital version, or stream for free if it ever comes back to Amazon Prime. In addition to getting access to Amazon's free streaming library, your free trial will also give you free two-day shipping on any item that has the "Prime" logo next to it (items sold or shipped by Amazon.com, as opposed to third-party sellers). Thirty days ought to be plenty of time to watch Creed, and probably some other movies or shows, but be sure to cancel before the trial ends if you don't want to pay for a membership.